Bring the water to the boil, put bonito flakes, and soak for 20 minutes then strain. Combine the hot dashi, Mirin, soy sauce & jasmine teas leaves and soak for 10 mins then strain. Take all the vegetables and coat lightly in tempura flour. 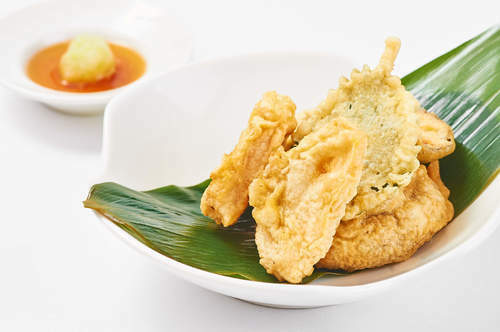 Dip the vegetables in the prepared tempura batter and deep-fried at 180°C until cooked. Remove the vegetables and drain on kitchen paper towel. Grate the turnip finely and green onion and squeeze out the excess water, place into a small ramekin. Set the vegetables tempura on Japanese tempura paper on a serving plate. Pour 30ml of the warm prepared tea tempura sauce onto the turnip green onion mix.